Editor’s note: The following article was written by relatives of Fr. Pythagoras Caravellas, and originally appeared in the 60th anniversary commemorative album for Annunciation Greek Orthodox Cathedral in San Francisco, published in 1996. The article has been reprinted at Annunciation Cathedral’s website, and we present it here courtesy of the San Francisco Bay Area Greek Historical Society. The Society has done outstanding work on the history of Greek Orthodoxy in the region, and its chairman, Jim Lucas, is building a virtual photo album which may be found at this link. The website includes special pages for Fr. Pythagoras Caravellas and St. Sophia/Annunciation Cathedral, where he served as a priest. We originally ran this article here at OrthodoxHistory.org on August 9, 2010. However, today is the 77th anniversary of Fr. Pythagoras’ repose, and I thought it appropriate to reprint his biography. Pythagoras Caravellas was born in 1890, in Greece, on the small island of Samos, off the coast of Asia Minor. He was the son of a tobacco and cotton merchant and the youngest of four children. At the age of 16, he completed his pre-university education at the gymnasium in Karlovassi. His schoolmasters, impressed with the young man’s curiousity and studious inclinations, recommended him for further study at one of the Greek teaching monasteries. The year that young Pythagoras was cloistered in the mountain monastery, he applied himself diligently to the assigned subjects, religion, science, and the humanities. Perhaps it was the humility with which the monks imparted their wisdom to the young scholars that influenced young Pythagoras to cherish learning. This inspiration was to follow him always. While under the tutelage of the monks, the Metropolitan of Corfu, Alexander, paid a visit to the monastery. The hierarchy of the Greek Orthodox faith had always taken a personal interest in the education and development of their youth. Alexander was not an exception. A man of deep perception, he was to become the first Archbishop of the Greek Orthodox Church. If his visits to the monasteries were anticipated by the students, a few requested were granted private audiences. The topics that generated the most interest were students’ personal aspirations. During one of his private conversations with the Metropolitan whom he had known since childhood, Pythagoras confessed his secret hope to continue his education in the United States and perhaps establish a permanent home there. Expecting a small admonishment or to be dissuaded from his ambition, Pythagoras was pleased with the unexpected approval his received. The full impact of this meeting was not to emerge for twelve years, but its immediate result was that Pythagoras entered the Seminary in Athens to study for the priesthood. After a year, he was uncertain as to the wisdom of his action and decided to enroll in the University of Athens. During the next four years he earned his degree and received his teaching credentials. While attending the university, he made occasional visits to his family in Samos. He also found time to tutor students, work for a tobacconist and take additional courses in English. In 1911, he made his big decision to go to the United States. He went to Middleboro, Massachusetts, where a small colony of Greeks had settled, to live with his two brothers, Nicholas and Theodore, who had immigrated there two years before. Convinced that their brother was not interested in their restaurant business, they encouraged him to enter Harvard University with an offer to help him financially. Before leaving Greece, Pythagoras had already decided to become a physician. Realizing how many long years of study lay ahead, he preferred not to accept his brothers’ generous offer. He considered ways in which he would attend school, allow time for studies, and still be able to earn an adequate income necessary for his tuition and living expenses. He would rely on his knowledge of small business accounting to earn his living and soon had a number of shopkeepers and restaurants as clients. After graduation from Harvard with a degree in medicine in June, 1917, he became engaged to Evangeline Constantine. They were married in November, 1917. His work as a hospital intern offered some degree of fulfillment, but he was restless. Recalling his year at the monastery and his communications with Archbishop Alexander, Pythagoras sent a letter to the Metropolitan asking for his guidance. The sincere simplicity of the Archbishop’s reply and his words of encouragement to enter the church convinced Pythagoras to give up medicine and to complete his studies in the priesthood. Through further correspondence with the Metropolitan, Pythagoras learned of the need for Greek priests in the western part of the United States. As waves of Greek immigrants moved westward across the United States, they were dependent upon a small group of itinerant Greek priests for infrequent church services and the administration of religious rites. More Greeks lived and worked in the western states than the number of churches would suggest. In 1921, Father Pythagoras arrived in San Francisco. At this time, his wife and daughter Theofani (Faye) were living in Chicago and it would be months later before he had the money to bring them to San Francisco. Once more the question of earning a livlihood and attending school was of immediate concern. Through letters of introduction and recommendation, Pythagoras became an assistant professor of Greek at the University of California, and attended the Pacific School of Religion. He supplemented his income writing for the Greek newspaper and the Christian Science Monitor. Soon, Pythagoras and Evangeline became an integral part of the young Greek community. Their resourcefulness and command of English, attracted the older families. They were often called upon to act as witnesses or interpreters in matters concerning immigration or in matters of law affecting members of the community. The more affluent Greeks were enthusiastic with the qualifications of the young couple and gave their wholehearted support for the erection of a church which would have Pythagoras as its priest. 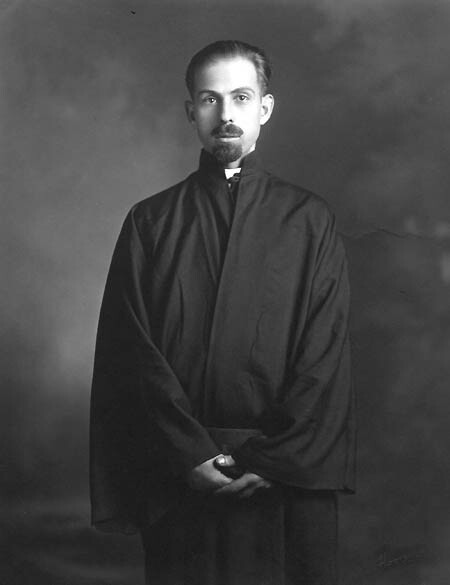 After his graduation from the Pacific School of Religion in 1927, Pythagoras was ordained into the priesthood of the Greek Orthodox religion by the Patriarch of Constantinople, Metaxakis, and Archbishop Alexander, both of who were visiting in San Francisco at the time. The colorful ceremony was held in the new, small white church of St. Sophia. The presence of these eminent prelates in San Francisco created much interest and served to establish the young church of St. Sophia as a unified and integrated religious community. With the advent of the Russian revolution, the organizational work of the Russian Orthodox Church in America came to an abrupt halt. In the meantime, the royalist-liberal controversy in Greece had divided event the Greek immigrants in America. The church could nor or would not steer a neutral course in the civil war raging between the forces of King Constantine and Premier Venizelos. This partnership, which had its beginnings in 1916, was to shake the church communities of Greece and United States to their foundation. The reaction in the United States was violent. Reorganization required a degree of cooperation difficult to obtain. Nevertheless, Father Pythagoras managed to steer his congregation away from the repercussions of the political battles in Greece and toward the establishment of a Greek-American community whose growth would be a blending of the cultural heritage of Greece and the democratic principles of their adopted country, America. Since coming to San Francisco, Father Pythagoras’ family increased by two daughters, Helen and Joan. After his ordination, Father Pythagoras budgeted his family severely. Occasionally, his small salary was supplemented by farmers; gifts of produce, fruit, and fowl. His parish was a poor one, and living became more difficult during the depression when members of his congregation dwelt on the edge of poverty. He administered to their needs, with words of encouragement and guidance. He would officiate at services during his frequent visits to farming communities. He taught the children of the community Greek after their regular school hours. He found time to program social activities for the community in observation of national and religious holidays. He made his rounds at the hospitals giving communion to the sick, the injured, and the dying. He conducted services every Sunday, every Holy Day and in the Greek church this alone is a rigorous and demanding schedule. In 1931, the physical strain had taken its toll. Father Pythagoras was will with tuberculosis. He was a patient for three years at the California Sanitorium in Belmont. During his confinement, he continued to read avidly and began work for his degree as a Doctor of Divinity. He looked forward to returning to his church and his congregation. In late 1934, the doctors told him that he was cured and that he would soon be going home. On December 6, 1934, he suffered a heart attack and died. He was mourned by Greeks throughout the nation and his body lay in state in the church of St. Sophia for 7 days to afford his many friends the sad privilege of a final farewell.